At what age do you, as a parent, start asking for your child’s consent? Below, you’ll find books that help kids respect the bodily agency of themselves and others. I say “NO” to my boys despite our free-rangey parenting style. I say it loudly. I say it firmly. I say it often. It’s worth the angry tantrums and the shouts of, “Mama, woo bein’ wude!” because my tall, white-presenting, handsome sons need to practice hearing NO so they accept that not everything is for them. We teach our sons that there is no appointment important enough, no urge irresistible enough, no need of ours that surpasses their control over who touches them and how. We talk about why we don’t tickle or hug unless we get enthusiastic requests for those tickles and how it’s not okay to negotiate or guilt someone into letting us touch them. And when they say “But whyyy can’t I tickle you?” I let them know that’s information they are not entitled to. No means no – there is no need for justification, explanation, or repetition. Sometimes as parents – we have no choice. That diaper has to be changed, they have to get buckled into the car. At that point – explaining that this is an issue of safety, explaining why (and for how long) this kind of touch is necessary helps. Give them as control over the situation as possible. Be transparent, and honest. There are few situations when we really need to touch our kids without enthusiastic consent. When we provide reasonable consequences and show them that we will back off when they say no, they know that word has power. I’m not going to force them to put on socks – blisters will teach them. We don’t force them to take baths – but they know they lose out on bedtime stories when they are too stinky to snuggle. Your child will find themselves in a tricky situation – and when they do, we talk about how to handle them and what responsibilities we have to protect ourselves and each other. You must read the body language of someone who doesn’t speak, or doesn’t feel comfortable saying no. You encounter people from cultures and generations who have different norms on touch. You need more space and less contact than they want. Others need less space and more contact than you want. You want someone to like you, but don’t want them to touch you. You have a relationship with an open invitation for contact, but want it to change (temporarily or permanently). You are hurting yourself or others and won’t stop, or it’s an emergency, and someone needs to intervene. You want to be touched, but in a different way. The best strategy I’ve heard is to set the standard that trustworthy adults don’t need children to keep secrets. Ever. If we teach children that an adult asking them to hide something is “tricky” and that that means they especially need to tell another trusted adult, it removes a ton of leverage from those who would abuse them. Instilling confidence that we are strong and ready and willing to protect both them and ourselves is imperative. Many abusive adults threaten children’s loved ones to keep them quiet. If the child trusts that their trusted adults can handle it and can keep themselves and the child safe, they’ll be less likely to be silenced by threats. Last but not least, children need to know that there is nothing they could do that would make them “bad” or make us love them less. Part of grooming children for abuse is setting them up to blame themselves/take responsibility for whatever is done to them. If the messaging is there that we will love them no matter what come hell or high water, it makes that roadblock less scary and insurmountable. If children can’t trust that we will still love them (and that we will believe them even when it’s their word against a grown up’s), they likely won’t come to us when they are in danger. If you get only one book from this collection, make it this one: Let’s talk about Healthy Body Boundaries, Consent, and Respect goes into fine detail on establishing a security network of trusted adults, gives kids scenarios to role-play. It’s the only book that show how it’s not okay to touch someone’s wheelchair or mobility device without consent, and how to respect the agency of non-speaking people. 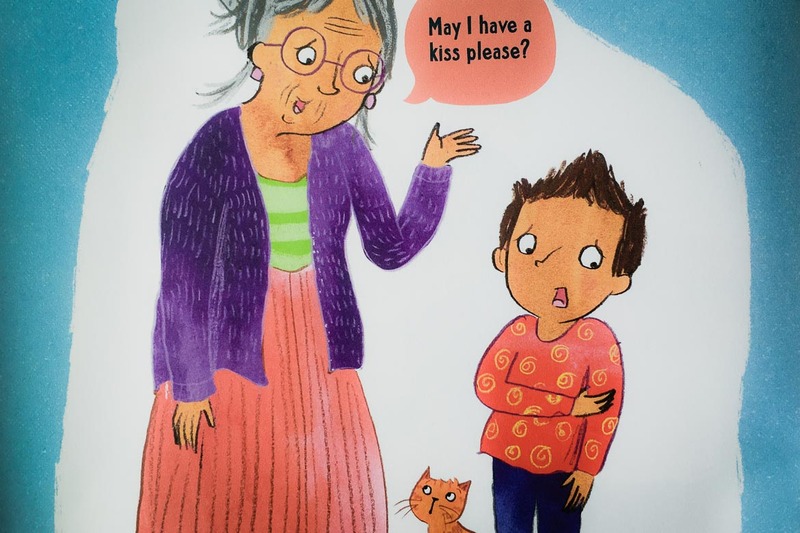 Not sure why the author thinks only those of us with social disabilities need to be taught about appropriate touch and consent, (actually – I do know, ableism!) but once you get past the cover, it’s actually a decent book that spells out social rules for what kind of touch is and isn’t appropriate. It’s a surprisingly helpful book, once you get past the bigotry. Maaaybe if more neurotypical kids read stuff like this, disabled people would no longer be targeted for sexual abuse at rates much higher than for non-disabled kids. JUST A THOUGHT. C Is For Consent is also making the rounds and it’s a simple, durable board book. But it’s also boring and blaaaand, so maybe check it out of the library if you’re curious, but it’s okay to skip. We spend a lot of time teaching our kids how to avoid being victims of sexual assault – but how many of us are teaching our kids not to assault other people? Protecting other people’s children is also your responsibility. Have you taught your kids it’s okay to say ‘No?’ Even to you? Particularly if you are raising a girl or nonbinary child, a child with a disability, or a child of color – PLEASE DO THIS. Your kids will encounter various versions of compliance training (both formal and social) that teaches them to put others’ comfort above their own – and this leaves them vulnerable. Saying NO is hard. We want people to like us! So teach your kids that you will always respect their ‘NO,’ and will love and support them no matter what. Reporting is not tattling. Ambiguity, fear, and self-blame pressure victims to keep quiet until things have gotten out of control. If they have an established a trusted security network (read Let’s Talk About Body Boundaries, Consent & Respect!!!) to turn to, kids are less vulnerable to grooming, coercion, threats and power-plays. Join us and ignite a generation of kind & brilliant luminaries. Subscribe for as little as $1/month to help more families raise compassionate kids. Bonus: you’ll get access to exclusive Books For Littles content I don’t share anywhere else.